Another place to buy fruit is from a local fruit market or a roadside stand. These markets can be more selective in the quality and freshness of their products. This retailer tends to have more invested interest in you, as a customer, and is probably a little more educated in the product. urchasing animals should not be a matter of convenience and lowest bottom dollar. 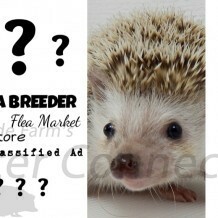 It may be well worth going out of your way to select a hedgehog that is right for you.